Bestselling and Newbery Medal-winning author Louis Sachar knows how to make readers laugh. 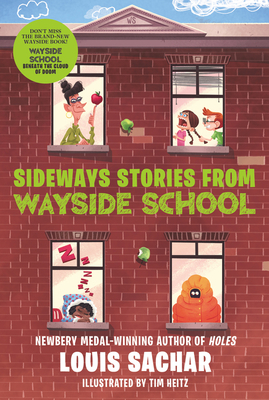 And there are laughs galore in perennial favorite Sideways Stories from Wayside School! Accidentally built sideways and standing thirty stories high (the builder said he was very sorry for the mistake), Wayside School has some of the wackiest classes in town, especially on the thirtieth floor. That’s where you’ll meet Bebe, the fastest draw in art class; John, who only reads upside down; Myron, the best class president, ever; and Sammy, the new kid—he’s a real rat. More than nine millions readers have laughed at the wacky stories of Wayside School. So what are you waiting for? Come visit Wayside School! When Louis Sachar was going to school, his teachers always pronounced his name wrong. Now that he has become a popular author of children’s books, teachers all over the country are pronouncing his name wrong. It should be pronounced “Sacker,” like someone who tackles quarterbacks or someone who stuffs potatoes into sacks. Mr. Sachar's first book, Sideways Stories from Wayside School, was accepted for publication during his first year of law school. After receiving his law degree, he spent six years asking himself whether he wanted to be an author or a lawyer before deciding to write for children full-time. His books include Sideways Stories from Wayside School, Wayside School Is Falling Down, Wayside School Gets a Little Stranger, and Holes, winner of a Newbery Medal and National Book Award.